Destiny 2 Ghost edition Alexa compatible RRP &#163;79.99. 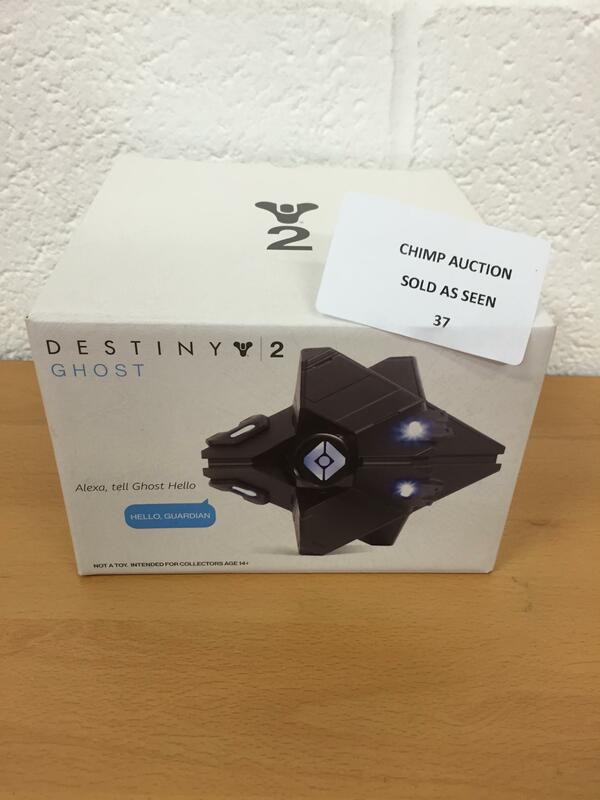 Destiny 2 Ghost edition Alexa compatible RRP £79.99. Unfortunately, your registration has been declined by the auctioneer. You can contact the auctioneer on 02088132169 for more information. You are the current highest bidder! To be sure to win, come back on 17 May 2018 20:03 BST Date Format as the lot closes or increase your max bid. For Chimp Auction delivery information please telephone 02088132169. PLEASE NOTE COLLECTION FOR AUCTIONS WILL BE IN OUR NEW LOCATION IN BIRMINGHAM. OUR LONDON BRANCH IS GOING THROUGH REFURBISHMENTS AND WILL BE OPEN IN THE NEXT FEW MONTHS. OUR BIRMINGHAM BRANCH WILL BE PROVIDING A CHEAPER DELIVERY SERVICE WHILE OUR LONDON BRANCH IS CLOSED. DO NOT BID UNLESS YOU ARE PREPARED TO PAY BY BANK TRANSFER, ON LINE PAYMENT OR BEING PRESENT AT THE SALEROOM AFTER THE SALE WITH A DEBIT CARD (CHIP AND PIN REQUIRED) OR CASH. 5% online surcharge which is added to the final sale price. All buyers must pay within 2 days of auction ending. Any buyers who default on payment may be “blacklisted” and barred from all further sales. WE DO NOT ACCEPT CREDIT OR DEBIT CARD PAYMENTS OVER THE TELEPHONE. The Lot(s) will not be released until payment is received and/or cleared through our Bank Account OR CASH PAYMENT RECEIVED. Payment must be received within 48 hours and collection of your items within 72 hours. Deliveries must be booked in within 24 hours. If you are collecting, or sending someone to collect on your behalf you will need to book in a timeslot at least 24 hours before. Please note that collection slots are only open between 12pm and 6pm Monday - Friday. We are closed on SATURDAY AND SUNDAYS. If on the day you are expecting to arrive outside of your designated timeslot please contact us immediately as we may not be able to release the goods when you arrive. The collection address is shown at the time of bidding and stock will be held at our stated location. If you need any further assistance do not hesitate to contact us. CHIMP AUCTION shall be under no liability for any delay or failure to deliver products or otherwise perform any obligation as specified in these terms and conditions if the same is wholly or partly caused whether directly or indirectly by circumstances beyond its reasonable control. All prices are shown in £s sterling and include VAT (where applicable) at the applicable current rates but exclude delivery charges, unless expressly stated otherwise. We will take all reasonable precautions to keep the details of your order and payment secure, but, unless we are negligent, we cannot be held liable for any losses caused as a result of unauthorized access to information provided by you. All our items are sourced from UK & European major retailers and abide by the UK standard voltage requirements. * ITEMS MAY HOLD NO RESERVE IN ACCORDANCE WITH OUR TERMS OF SALE AND IN AGREEMENT WITH RELEVANT VENDORS. SOME ITEMS MAY HOLD A RESERVE AS INSTRUCTED BY OUR VENDORS. REFUNDS WILL ONLY BE VALID AND ISSUED IF THE LOT/ ITEM HAS BEEN MISDESCRIBED OR INCORRECTLY SOLD BY OUR AUCTIONEER. IN THE UNLIKELY EVENT, WE HAVE MISDESCRIBED AN ITEM, ALL CLAIMS FOR A REFUND OR EXCHANGE MUST BE DONE ONSITE AND WHILE BEING COLLECTED FROM OUR PREMISES AND ALL QUALIFIED REFUNDS MUST BE DONE ON THE SAME AUCTION DAY. ALL DELIVERED GOODS MUST BE INSPECTED WITHIN 48 HRS OF RECEIVING THE GOODS. ALL CLAIMS/ DISPUTES MUST BE RAISED WITHIN 48HRS OF RECEIVING THE GOODS. IT IS UPON THE RESPONSIBILITY OF THE BUYER TO CHECK ITEMS ONSITE OR WHEN DELIVERED, SHOULD THERE BE ANY MISDESCRIPTIONS FROM OUR PART. ALL LOTS QUALIFY ONE FREE TEST & INSPECTION SERVICE* ALL LOTS THAT EXCEED THE FREE TEST & INSPECTION SERVICE WILL BE CHARGED AS £1 PER LOT PER INSPECTION. ALL LOTS CAN BE VIEWED, INSPECTED AND TESTED FOR FREE SHOULD YOU WISH TO BOOK AN APPOINTMENT AND ATTEND OUR PREMISES IN PERSON. BY USING OUR TEST & INSPECTION SERVICE, YOU AGREE TO OUR CONDITION & FUNCTIONALITY REPORT TO BE ACCURATE. ACCEPTING THOSE TERMS ILLUSTARTES THAT OUR TEST & INSPECTION SERVICE IS LIMITED WITH REGARDS TO ALL CONSUMER ELECTRONICS FUNCTINALITY AND THAT DEVICES MAY CONTAIN INTERMITTENT FAULTS. WE DO NOT TEST ALL LOTS THAT ARE UNDER THE PERIPHIRALS CATEGORY. WE DO NOT ACCEPT REFUNDS OR EXCHANGE ON ANY OF THE LOTS PURCHASED FROM OUR AUCTIONS. You cannot cancel an order or return goods once purchased from any of our auction platform. Please refer to our terms of sale. When an auction ends all items must be collected within 3 DAYS FROM OUR REGISTERED ADDRESS. You or someone on your behalf can collect the items providing they have your name, bidding number and invoice. PLEASE NOTE; WE ARE NOT RESPONSIBLE FOR ANY DAMAGES DURING DELIVERY. WE WILL DO OUR BEST TO PACKAGE ITEMS VERY WELL TO AVOID ANY DAMAGES. Once payment is received your items will be dispatched within 3 working days. Items should be received within 3-7 working days. IF PAYMENT IS RECEIVED LATE YOUR ITEMS WILL ARRIVE LATER THEN THE TIME STATED. TO ENSURE YOUR ITEMS GET DELIVERED IN A TIMELY FASHION, PAYMENT MUST BE MADE WITHIN 24 HOURS OF AUCTION ENDING. We reserve the right to amend or add to our terms of sale without further notice. Buyers must read our important information section for each auction before committing to bid.